Earlier this year, the Q&A module was released to the community as a beta and installed and serves as the Community Exchange on dotnetnuke.com. As awareness of the Community Exchange increased, I started getting more and more questions about the module and how user's can have more insight into how they gained reputation. At the time, I didn't really have anything to make this possible. It was also about this same time that I started to get some idea of the new opportunities the DotNetNuke 6.2 release was going to provide developers. The result of this is a few updates to the module that gives users what they are asking for while leveraging some of the most exciting new features in the DotNetNuke 6.2 release (which were only possible due to the efforts of our engineering and QA teams who did an excellent job with this release). "Created in the spirit of Stack Exchange, the DotNetNuke Q&A module provides a more focused and open alternative to traditional discussion forums. It provides the ability for users to ask and answer questions, and, through membership and active participation, to vote questions and answers up or down and edit questions and answers. Users can earn reputation points for their valued contributions, which represents a kind of gamification of the traditional Q&A site or discussion forum." Okay, maybe this one isn't related to the new social elements in 6.2 but it is in the spirit of DotNetNuke's dedication to CMS (cloud, mobile, social) and it is new to this release. Also, future releases of the module will continue to support Azure and any related issues will be treated as high priority bugs. Staying with CMS for a moment, I have spent some time answering questions from my iPad. The journal, simply put, is an activity stream. If you are building a community site of your own, you will want to utilize modules that integrate with 6.2's Journal. With regards to the Q&A module, each time a user asks a question or providers an answer, an entry is sent to the journal (that user's activity stream). Each time the user comments, gains a new privilege, up-votes or down-votes a question or answer; this activity is sent to their stream as well. If you haven't had a chance to see a journal activity stream, you can check the one out on our Community page here. One of the problems in the initial betas was that there was no way to find questions or answers provided by a specific user. It was possible to quickly view a list of your own questions or answers, but the same couldn't be said for other site visitors (and now your friends too). 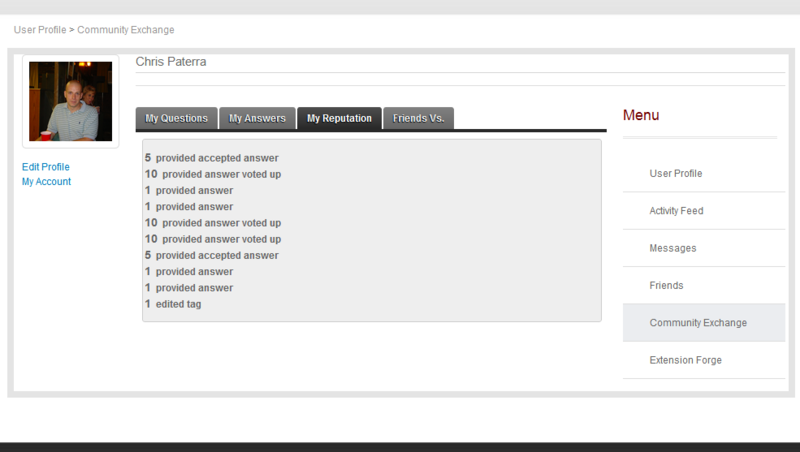 Now, users who view your profile can see your most recent questions or answers. Also, for user's who wonder how they have accumulated points (one of the more common requested features), they can also see a list of their most recent reputation activity from their profile. This feature also is displayed in a user's profile but, like "My Reputation", it's only visible to the user's friends and the user (something new to 6.2). At first glance, what is going on here may not be apparent but those of you who have played some multi-player games on Xbox Live may be familiar with the concept. Basically, your reputation is compared against your friends who also participate in the Community Exchange and you are shown in a 'leader board' comparing your reputation scores. 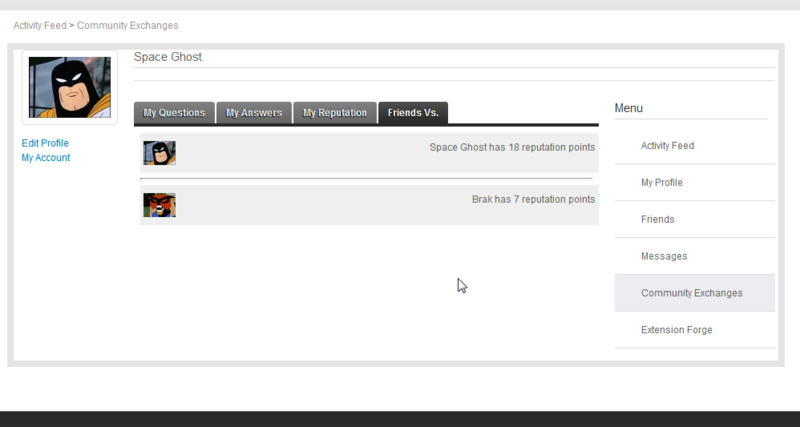 Currently, you can't take part in "Friends Vs." on dotnetnuke.com but look for that to change in the near future. If the Q&A module or the social enhancements in 6.2 aren't reason enough to move to 6.2 (which is just crazy talk), also look out for more modules utilizing key social 6.2 concepts to come out soon (to name a few: Contest, Blog, Active Forums).